This is a list of brands owned by Anglo-Dutch multinational company Unilever. Unilever is the world's biggest ice cream manufacturer, with an annual turnover of €5 billion. 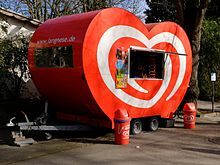 With the exception of its U.S. brands Popsicle, Klondike, Talenti gelato, Breyers and Ben & Jerry's, the bulk of the company's ice cream business falls under its "Heartbrand" brand umbrella, so called because of the brand's heart-shaped logo. Unilever currently operates eleven ice cream factories in Europe; the biggest include factories at Hellendoorn in The Netherlands, Heppenheim in Germany, Caivano in Italy, Saint-Dizier in France, Gloucester in the United Kingdom and Santa Iria de Azóia [pt] in Portugal. The Heartbrand was launched in 1998 (and slightly modified in 2003) as an effort to increase international brand awareness and promote cross-border synergies in manufacturing and marketing ("centralisation"). It is present in more than 40 countries. Although the logo is common worldwide, each country retained the local brand name so as to keep the familiarity built over the years, one notable exception being Hungary where the previous Eskimo brand was replaced with Algida in 2003. In 2005, Israeli food conglomerate Strauss, whose ice cream brand is a joint venture between Strauss and Unilever and marketed under the Heartbrand name, received special permission from Unilever to export its brand of ice cream, Glidat Strauss to the United States because of the strict kosher certification the products in Israel have. Under terms of the agreement, Strauss ice cream and krembo may be sold only in kosher supermarkets and import shops. It is distributed in North America by Dairy Delight, a subsidiary of Norman's Dairy. Prior to the heart logo, each country could choose its own logo, although the most common one consisted of a blue circle with the local brand's name over a background of red and white stripes; the second most common old logo, used by Wall's in the UK and other countries, was a yellow logo with Wall's in blue text. Unilever generally manufactures the same ice cream with the same names, with rare occasions of regional availability, under different brands. Some of these ice creams include Carte D'Or, Cornetto, Magnum, Solero, Twister, Choc Ice, Super Split, Fat Frog, Feast, Brunch and Viennetta. Many of these sub brands were previously independent local ice cream vendors while others were introduced into the country by Unilever. ^ 2008 Annual Report and Accounts Archived 2010-01-02 at the Wayback Machine pp. 5–6. ^ a b "Unilever Heartbrand". Unilever. Archived from the original on 2006-11-23. Retrieved 2006-09-08. ^ "Unilever Company Profile". Ice Cream Park. Retrieved 2015-11-05. ^ "Nestle steps up ice-cream war with Unilever by buying Dreyer's". The Independent. 18 June 2002. Retrieved 27 July 2018. ^ "Dollar Shave Club just sold for $1 billion to Unilever". 2016-07-20. ^ "Our brands Mentadent". unilever.com. Unilever. Retrieved 13 July 2017. ^ "Mentadent". unilever.com. Unilever. Retrieved 13 July 2017. ^ "Unilever Completes TIGI Acquisition". GCI Magazine. 14 April 2009. ^ "TIGI consumer site". Archived from the original on 2010-06-19. ^ "Brands in action | Unilever Global". Unilever.com. Retrieved 2012-10-26. This page was last edited on 27 March 2019, at 08:33 (UTC).